I’m back from my sixth year at GDC! I wrote up my last two trips, and the protests weren’t quite loud enough, so I’m doing it again this year. Don’t worry; the protestors might manage to kidnap me outright this year, so you won’t have to put up with me ever again. As always, sites like Gamasutra, Slashdot, and GameSpot have more comprehensive reports. What’s more, the full proceedings will soon be available online at GDCTV and GDCRadio. They have me outnumbered, so I won’t try to compete with them on coverage or details. Instead, I’ll put on my amateur analyst hat and lay out some of the common themes I noticed. Look out, Gartner, here I come! E3 is Dead, Long Live GDC? Which GDC Speaker Are You? The pre-GDC buzz this year centered around the implosion of E3, the game industry’s flagship trade show and press event. With E3 downsized to a invite-only press junket, and GDC’s expo floor doubling in size, many wondered if GDC would take over E3’s crown, for better or worse. GDC has come and gone, and the answer seems to be a qualified no. Yes, the expo floor was bigger, but as usual, nearly half of it was dedicated to closed-door meeting rooms. Sure, there wasn’t much focus this year, but there’s never been much focus, and that’s not necessarily a bad thing. This year’s GDC was the same as it’s been every year: getting developers, publishers, press, and toolmakers together to talk about anything and everything. Whether it’s in a massive hall or a small roundtable, at a scripted keynote or a fiery off-the-leash rant, there was plenty of good, old-fashioned talk this year. It’s not always pretty or soundbite-friendly, but it’s always worthwhile. The overriding theme this year can be summed up in three words: YouTube for games. Everyone was chasing full-speed after the user-generated content bandwagon. The big three platforms all had their official stories, and lots of others were clamoring to tell theirs too. The big headline was Sony’s announcement of PlayStation Home and Little Big Planet. PlayStation Home has been compared to Second Life, and the description is apt. It’s a physics-based virtual world with both public and private spaces. Users can customize their avatar’s face, body, and clothes, decorate their apartment, and contribute to public spaces. Options include downloadable content, free and paid, and the user’s own videos and photographs. Home is mostly interesting for its business and product significance, since Sony has traditionally avoided running online services for PlayStation themselves. As a Second Life clone, it’s shallow at best. Sony will probably control user-generated content with an iron fist, so robust content creation tools seem unlikely. Content will tend toward digital photographs, Sony products, and trailers and clips from Sony movies, games, and music. Little Big Planet takes the same approach. It’s the first AAA product from Media Molecule, the people behind Rag Doll Kung Fu. It’s a rich, physics-based, side-scroller sandbox. It will come with some levels built in, but it will also include simple in-game tools for users to build and share their own levels and mini-games. It looks really, really cool, even if it’s ultimately fairly limited. Microsoft took their first steps toward user-generated content over a year ago with the second generation of XBox Live. It included gamer tags, achievements, and most importantly, XBox Live Arcade. They followed up with the groundbreaking XNA Game Studio Express, which allows homebrew developers to make their own XBox 360 games. Hackers had done this on other consoles for years, but this was the first time a console maker had opened a retail console to legitimate homebrew development. It was a big deal. Even better, another big deal is on its way. In his talk on the past, present, and future of XBox Live Arcade, Chris Satchell casually mentioned the next big thing for XBL. He called it Community Arcade, and described it as the natural evolution of XBLA and XNA Game Studio Express. Basically, it’s YouTube for XBLA. Garage developers will make games, upload them, and XBLA users will immediately be able to download them, play them, and rate them. No more onerous certification process. Instant gratification! These are markedly different approaches to user-generated content. They may be parts of greater corporate product plans, but just as importantly, they tell us a great deal about the souls of these platform giants. Sony is, at its heart, a content company. It thinks about movies, records, and games first. Hardware and software come second, and are often farmed out to other people. In keeping with that outlook, Home and Little Big Planet focus on sharing content. No programming necessary. No programming allowed. On the other hand, Microsoft is, at its heart, a software company. Specifically, Microsoft is an operating system company. It makes platforms for other companies to make products on top of. When Microsoft thinks user-generated content, it doesn’t think content, it thinks code. It thinks developers. This cuts to the core of Microsoft’s identity, in the same way that content does for Sony. Nintendo didn’t add anything to their story about user-generated content at this GDC. They’ve dabbled in it with Animal Crossing, with Miis on the Wii, and they’ve left the door open with Channels. Regardless, Nintendo is, at its heart, a game company. It’s focusing on what it’s always focused on: games. The PC and web have been home to homebrew game development and user-generated content for decades, so they didn’t earn the same headlines as Sony and Microsoft this year. Still, GDC highlighted some notable developments. GameTap and Steam continued to lead the indie game development trend. Like last year, Gametap offered development contracts to many of the IGF finalists. Newcomers to GDC included Kongregate and GameGum, highlighted in Raph Koster‘s talk Where Game meets The Web. Both sites are true YouTubes for games, although they’re both Flash-only. A number of people, Raph Koster and Daniel James among them, drew attention to the fact that some of the biggest games in the world have flown under the radar of the mainstream game industry. Most are MMOs. Some, such as Club Penguin and Webkinz, are aimed at kids. Others are spinoffs of television shows or other brands. Viacom has launched three, including Virtual Laguna Beach, in the past six months. Others, like Silkroad Online, Maple Story, and Flyff, are based primarily in China and Korea, and are entirely free. Many of these have strikingly narrow, niche gameplay, but still boast millions of subscribers. These games are rarely sold in boxed retail SKUs, and they rarely require a monthly subscription fee. Many are tie-ins to retail products, television shows, or other media. Others are advertiser-funded. The ones in Asian markets are often free to download and play. They’re funded by microtransactions, users buying virtual items for their in-game characters. These are bleeding-edge, forward-looking business models, and it’s too early to say which will be financial successes. We already know that they’re successful as products, though, based on the number of people playing them. Industry veterans like Todd Hollenshead may bury their heads in the sand, scared that the sky is falling due to piracy and counterfeiting. Meanwhile, this new guard will be trailblazing a path for games of the future. Another prevalent theme of this year’s GDC was alternative forms of input. Conventional examples included the Wiimote and the DS’ touch screen and microphone, but developers explored more radical controllers as well. The DS and Wii are here to stay. In Japan, that’s an understatement: based on sales numbers and anecdotal evidence, the DS is the dominant Japanese game console right now. Similarly, in the next-generation console race, Wii enjoyed a stronger launch than either XBox 360 or PS3. Analysts, eat your hearts out. GDC reflected this. There was a plethora of Wii and DS talks, focusing on taking advantage of their unique controllers. Across the board, developers were excited about the possibilities, both for gameplay and for attracting a wider audience. In an interesting twist, both the Experimental Gameplay Workshop and IGF finalist Racing Pitch featured audio input. What’s more, they went beyond the simple blowing and voice commands that DS games have featured so far. Racing Pitch is a racing game, but without the traditional gas and brake buttons. Instead, you hum the sound of an engine into a microphone – no joke! – and your car speeds up, or slows down, based on the tone of your voice. Similarly, many of the EGW’s Indie Game Jam and Gamma games required you to sing into a mic to control them, a la SingStar and Karaoke Revolution. A few went so far as to move an in-game character, in two dimensions, solely based on your voice! It sounds wonky, but it was surprisingly intuitive. Even the Game Design Challenge, that perennial favorite, threw its hat in the alternate input ring. This year’s theme was a controller: Eric Zimmerman challenged his three contestants to design a game with only a needle and thread as input. So weird…so intriguing! David Jaffe, Alexey Pajitnov, and Harvey Smith took the challenge. Jaffe proposed a paper airplane game, complete with online sharing of airplane designs and levels. True to his tetris roots, Pajitnov presented an abstract, elegantly simple multiplayer puzzler. Smith went the aesthetic route, envisioning a traditional adventure game in a rich, patchwork fantasy world. Over the course of six GDCs, I’ve seen the career arcs of a number of prominent industry speakers. Many are normal, garden-variety developers and publishers, just trying to give something back to the community. The more interesting characters, though, often fall into a few distinct personalities. Behold…the GDC speaker menagerie! The party mouthpiece is a fairly common species of big-name GDC speaker. These speakers’ first and only job at GDC is to represent their company, usually either a platform maker or a large publisher. 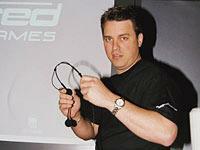 Notable examples include Phil Harrison, Reggie Fils-Aime, Peter Moore, and J. Allard. This species can be distinguished by its slick, scripted keynote speeches and smart marketing-speak during interviews. When left unsupervised, the party mouthpiece can grow dangerously big. Its ego becomes bloated from speaking engagements and media pandering, and it eventually begins to believe its own overblown hype and talent. At this point, it has outgrown its host company, and thinks it can survive on its own. What’s worse, venture capital firms are seduced by the same speaking engagements and media pandering, and fund the overinflated ego! They lavish it with money and employees, and it strikes out on its own…only to learn, years later, that its overinflated ego was only that. I won’t name names, but I saw a few canonical examples at GDC this year, in different stages of the life cycle. It’ll be interesting to see how they end up! On the other end of the spectrum is the reluctant role model. This is usually a talented developer who makes great games, one of which eventually becomes a hit. They’re suddenly thrust into the spotlight, whether they like it or not. Chris Taylor, of Total Annihilation and Supreme Commander fame, exemplified this species at this year’s GDC. Chris held court for over an hour at his 9am Supreme Commander talk. He’s hilarious, larger than life, and a born performer. He eschewed notes and slides and held his audience rapt for nearly an hour. Chris talked about his history in the industry, his past games and companies, and the path to shipping SupCom. I was impressed by his enthusiasm for building the Gas Powered Games organization, focusing on unusal (for the game industry) concepts like sustainable working hours and healthy perks. He may be nearing the age of 40, but Chris was overflowing with energy. You could tell he’d been manic when he was younger, and it would surely have been all to easy for him to burn out. He’d obviously matured and seen the light, though, and he’d instilled the values of health and work/life balance in his team. It was sobering, and very inspiring. No, really. Chris’ talk reminded me that I really do enjoy pretending I’m part of the game development community. Sure, even if I was a developer at one point, I know I’m not any more. I still spend a lot of time following the industry, though. One of the things I like most about GDC is feeling like I’m part of the community, even for just a bit. Events like the platform keynotes, Game Design Challenge, Experimental Gameplay Workshop, Programmer’s Challenge, and IGF and Game Developers Choice Awards really drive that home. It doesn’t last, and it’s kind of cheating, since I’m not really a game developer, but it’s still a great feeling. …and just like that, another GDC has come and gone. Sigh. See you next year! nintendo recently announced their plan for indie, user-generated games with WiiWare. indie developers will be able to make full-fledged downloadable Wii games and sell them for points, similar to XBLA and PlayStation Network. the development side is unclear. will developers still need a dev kit? will a PC and a retail Wii be enough? regardless, it sounds like the certification process will be way less painful than XBLA’s or PSN’s. overall, this is great news. sony, wake up! you can say whatever you want, but everyone knows that WiiWare and XBLA community arcade are light years ahead of your little PS3 linux distro.